Over the past few weeks, a number of bright meteors and fireballs have been reported. On this blog, there have been reports from Colorado, New Jersey, Illinois, Florida, Michigan and Arizona. Over at the Fireball Report page of the American Meteor Society (AMS), multiple fireballs are being reported every night. So what’s going on? There is a good chance that many of these fireballs are from the Taurid meteor complex. Most meteor showers are only visible for a few weeks to maybe a month. Often most of their activity is concentrated in a few night window around the time of their peak. The Taurids are different, though. Those who have paid close attention to my daily postings will notice that the Taurids have been active since late September. They will continue to produce meteors until the end of November. Another difference between Taurids and most other showers, is when they they take place. Most showers can only be observed after midnight. The Taurids can be seen at all hours of the night, whether morning or evening. As a result, they are active at a reasonable hour when many people are still awake and outside.So for the average person who is out and about in the evening, the months of October and November provide a greater than usual chance of spotting a nice meteor or fireball. How can you see the Taurids? The Taurids are visible at any time of the night. There are two separate branches of the Taurids, the Northern and Southern Taurids. Both showers are located within a few degrees of each other. In November, the radiants of both showers are located in the constellation of Taurus. Video data compiled by Sirko Molau find that the Southern Taurids are active from September 8 to November 30 with a broad peak around October 11. The Northern Taurids are active from October 8 to December 13 with a broad peak around November 14. Right now, both showers are active though more of the activity will be from the Northern branch. The rates for the Taurids is fairly low. These are not major showers and at their best produce 10-15 meteors per hour from a dark site around midnight. For evening observers under suburban skies, the rates will be much lower. The thing to watch out for are evening fireballs. It is predicted that this year will see more fireballs than usual from the Taurids. Taurid meteors look rather different from most meteors. Unlike the Orionids which are fast and only last a split second, Taurids are much slower and longer lasting. I have seen many early evening Taurids that appear as small green orbs or spheres that can take up to 3 seconds to cross most of the sky. Quite often they will be followed by a thin, short-lasting white tail or trail. They are definitely impressive. Where do Taurids come from? Taurid meteors are produced by Comet Encke which is one of the best observed comets in history. The reason for this is that it circles the Sun once every 3.3 years which provide lots of opportunities to observe it when bright. The fact that the comet is rather large and does not get very far from the Earth and Sun means that it is always observable by professional (and even some of the largest amateur) telescopes. But even after centuries of observation, Encke remains an enigma and continues to give professional comet researchers fits. Comet Encke was first observed by the prolific French comet hunter Pierre Mechain on 1786 January 17. The comet was relatively bright (5th magnitude) but located deep in the bright twilight sky. After a few days, the comet moved to close to the Sun and was no longer observable. As a result, it became lost. Fast forward to 1795 November 7, Caroline Herschel (the first female comet discoverer and brother of William Herschel, the discoverer of Uranus) of Slough, England found a “new” comet which was observed for only a few weeks. There were not enough observations to identify the comet as a short-period comet. The 3rd “discovery” of Comet Encke occurred on 1805 October 20 when Jean-Louis Pons of Marseilles, France (until the last 15 years, Pons was the leading comet discoverer with 26 comets to his credit) discovered a comet which was followed for a month. Pons was so prolific at finding comets that he unknowingly found the same comet again on 1818 November 26. One may be wondering why this comet is named Comet Encke rather than Comet Mechain-Herschel-Pons. Johann Franz Encke was a German astronomer and mathematician. In 1819, Encke calculated an orbit for Pons’ 1818 comet and noticed that it resembled the orbit of Pons’ 1805 find. Working the orbit, Encke quickly relaized that the two Pons comets were really the same comet returning every ~3 years. Further work identified Mechain’s 1786 comet and Herschel’s 1795 comet as previous apparitions of Pons’ comet. In honor of Encke’s work, the comet was named Comet Encke. It is rare for a comet to be named after the mathematician who computed its orbit rather than its discoverer but there are a few cases of this, especially centuries ago. The most famous example being Comet Halley. Edmund Halley did not discover Comet Halley but he was the first person to recognize that his namesake comet returned at regular intervals. Comets Lexell and Crommelin are other examples of comets being named after an orbit computer. Since 1818, Comet Encke has been observed at every perihelion (closest approach to the Sun) except for one in 1944 at the height of World War II. Nowadays, it is rare for Comet Encke not to be observed at least once a year. In fact, Encke was the 2nd comet, after Halley, to be observed at more than 1 return, hence its official name of Comet 2P/Encke. The comet is currently located on an orbit that takes 3.3 years to circle the Sun. The comet’s orbit ranges from a perihelion (closest to the Sun) of 0.34 AU to an aphelion of 4.10 AU (farthest from the Sun). 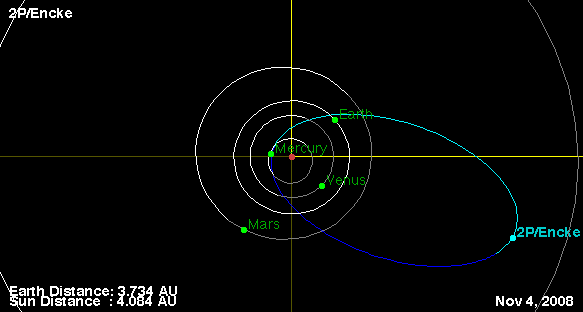 Its last perihelion was on 2007 April 19 and the next one will be on 2010 August 6. There is a short window before or after every perihelion when Encke is visible in small telescopes. The comet never gets bright enough for naked eye observations. 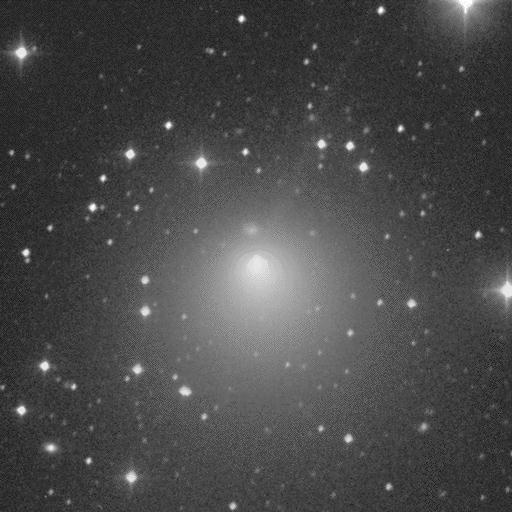 This is an image of short-period comet Encke obtained by Jim Scotti on 1994 January 5 while using the 0.91-meter Spacewatch Telescope on Kitt Peak. The image is 9.18 arcminutes square with north on the right and east at top. The integration time is 150 seconds. Where does Comet Encke come from? Until a few years ago, it was theorized that all comets formed in the outer solar system beyond the orbit of Jupiter. As the outer planets migrated towards their current orbits, some comets were ejected into the Oort cloud, located out to a quarter of the distance to the nearest star, the Kuiper Belt, a belt of comets located just beyond Neptune’s orbit, or the Scattered Disk, located between the Oort cloud and the Kuiper Belt. Short-period comets, with periods less than ~20 years or so, spent billions of years in the Kuiper Belt or Scattered Disk before being kicked back into the inner solar system by the gravity of the outer planets. As a result, all comets go out as far from the Sun as the orbit of Jupiter or much further out. Encke only goes out to 4.1 AU. Since Jupiter is located at ~5 AU, Encke is safe from most of Jupiter’s gravitational interactions. The question is how did Encke get there? Computer models find that it is very difficult to get an object from the outer solar system onto a Encke-type orbit. Though not impossible, it would require a very long amount of time. So long, in fact, that Encke should have burned out (run out of ice and volatiles) many 100,000s of years ago and should either appear as an inactive asteroid or perhaps have broken up into nothing more than dust by now. So what happened? It is possible that Encke took a very long time to get to its current orbit but was inactive, or dormant, for most of that time. If true, it would not have run out of ice and its cometary activity is a recent phenomenon. As we saw with the recent re-discoveries of Comets Giacobini and Barnard 3, comets can be inactive or barely active for many orbits. Another possibility is that Encke is not from the outer solar system but rather from the Asteroid Belt between the orbits of Mars and Jupiter. It was long thought that the asteroids in the Asteroid Belt were all dead, dry objects, but recently a number of asteroids have been found that display the same activity as comets. Perhaps Encke was an asteroid from the Asteroid Belt until a collision or break-up event exposed a large area of ice resulting in cometary activity. Unfortunately, we could know a lot more about Encke but a planned mission to study Encke, and other comets, failed leaving Earth orbit. NASA’s COmet Nucleus TOUR (CONTOUR) mission was to fly-by Encke in 2003. I live in Hagerstown, MD and saw something extraordinary about two months ago while I was driving in the late evening. It was a like a really large “shooting star”, but moved much slower and was visible much longer than any shooting star I’ve ever seen. Could this have been a taurid meteor? No one else saw it or believes me…I am determined to find out if that was something that researches may have been following. Any guesses? Do you know what day you saw the fireball? on Oct 28 @ ~8pm, Oct 22 @ ~9:30pm, Oct 12 @ ~9:30pm, Oct 4 ~10:10pm, Sept 3 @ ~10:00pm. There undoubtedly were many more which weren’t reported. It may have been a Taurid since if it was seen in late Sept or Oct. It is also possible that it wasn’t related to any particular meteor shower or it was a piece of an old rocket or satellite re-entering. not spam my freind. this is very important and much more than a conspiracy. do some research as I have into the impacts of shoemaker levy into jupiter in 1997 and the 2009 huge impact of a cometary fragment into jupiter for clues as to how this apron of “encke-oltjay keeps gathering steam in its 3.5 year travels around the sun intersecting jupiter and the dust fragment clouds from the two impacts. we have a huge solar flare also occuring at this time on the sun which also affects the orbit of encke. it is in the first phase of its 10 year cycle return. this comet was supposed to have been the one that disposed of the bronze age culture. do not take this warning lightly! has a direct bareing on the perturbations of the geomagnetics of our earth…it will also affect and impact the moon in the future(which in turn will also create grater havoc here. What damage would an Asteroid Impact cause? A near earth Object (NEO) does not need to be large to devastate. One the size of a small garage would annihilate a large city. One big enough to leave a 10km crater, still nowhere near the size of the biggest (there is a 300km crater on Earth), would have the destructive force of every one of the world’s 10,000 nuclear warhead combined. It is thought that 65 million years ago in what is now Yucatan the impact at a velocity of 11 km/second of a 10-kilometer wide asteroid is what helped to bring about the K-T extinction, whereas no land animal with a size greater than the size of a small chicken was able to survive. Those that study this time frame believe that if man had inhabited the planet at this time, he surely would have been destroyed by this particular event. This event threw huge amounts of matter into the atmosphere in addition to this, it caused 2000 foot waves that may have all but completely emptied the Gulf of Mexico. This event created months of darkness (which interfered with photosynthesis) and much cooler temperatures globally, and the resulting harsh conditions which in turn led to the extinction of many species, including the last of the dinosaurs. Although this is quite compelling as a hypothesis, it remains controversial and has broad but not total acceptance within the scientific community. It is an estimate that impacts of asteroids as large as the one thought responsible for the K-T extinction occur about once every hundred million years. On the date of June 30th, 1908, at about a quarter after 7:00 a.m., a very mysterious explosion occurred in the skies over Tunguska, Siberia, located in Russia. This explosion happened at anywhere between six-to-eight kilometers from ground zero, and the resultant action in this was to lay waste to a vast region of pine forest of 2,150 square kilometers, felling more than 60 million trees. This was seen as a brilliant burst of light from the inhabitants of the region of 50 kilometers around. Witnesses claim that the explosion was so loud and powerful as to blow-out windows, temporarily blind and knock people to the ground, and sounded like a deafening roar. Had it happened fifty years later, it is surmised by scientists, (placing it within that time-frame of the Cold-War) it would most likely have spurred that nation into a nuclear war. In 1972, an estimated 1000-ton object skimmed upon the edge of Earth’s atmosphere over the Grand Tetons National Park in Wyoming, and then skipped back out into space, like a skimming-stone off water. This event was photographed by tourists and also was detected by Air Force satellites. Had it approached at a 90° angle into the atmosphere, it most likely would have caused a Hiroshima-scale explosion over Canada, only a bit down-sized from the scale of the Siberian blast. In 1992, a meteorite weighing 12.4 kg. was recovered after it had made a spectacular appearance over Peekskill, N.Y., where it was described as being as bright as a “full-moon”. This event was recorded by 16 separate video cameras, some of which were located at a local high-school football game and were recording the game! On January 19, 1993, a very bright asteroid crossed the sky of Northern Italy, ending with an explosion approximately over the town of Lugo, Italy. The explosion (14 kilotons of energy) generated shock waves which were recorded by six local seismic stations. This particular type of asteroid did disintegrate at a great altitude, which is quite lucky for the town of Lugo. Had it been an the type of asteroid that would have been composed mostly of iron ferrites, of which only some 6% of all asteroids are known to be comprised as such, chances are that it would have disintegrated at a much lower altitude creating a great deal of death and destruction. In 1994 the US Department of Defense made public domain its records on energetic bolide-type asteroids over a time span of about twenty years. This data indicates that, from 1975 to 1992, there were 136 airbursts of energy greater than 1 kiloton, but the real number was probably at least 10 times higher, because the satellite system does not cover the entire surface of the Earth. What would happen during a large collision? In 1994 a large comet (P/Shoemaker-Levy 9) hit Jupiter. The Hubble telescope recorded the impact with tremendous accuracy. As it entered the atmosphere of Jupiter temperatures reached over 20,000 degrees. The impact sent a fireball thousands of miles into space. [Image compliments of the-planet-jupiter.com. A magnificent artist rendering of Shoemaker-Levy 9 breaking up, and impacting into Jupiter] The scale of the impact may look small in scale, but bear in mind the size differential between Jupiter and Earth. The damage of an impact on Earth would kill all life. Massive earthquakes would jet out around the globe at thousands of miles an hour, destroying all buildings and life in their path. It would also trigger volcanic activity setting off eruptions and explosions all over the world. An enormous dust cloud would be sent into the atmosphere. A fireball would be sent into the sky miles tall. Any life that had survived the inital impact would be overcome with a whole new set of problems. Peices of the earth and dust would block the atmosphere, preventing the earth from getting any sun. Plant life would become extinct, and humans would face the horrifying reality of a nuclear winter. How many asteroids do we have to worry about? Hundreds… thousands. The largest yet discovered are an awesome 18 miles in length. Scientists estimate that there could be as many as 1000 asteroids larger than 1 mile across that pass relativly close to Earth. An impact by any one of these would be an Extinction Level Event. How often is Earth hit by an asteroid? More frequently than you may think. An incident like Tunguska occurs approximately once per every hundred years. Smaller ones, but easily big enough to take out a large city, occur at least 3 times per century, for example Brazil in 1930. While most of the recent recorded impacts have happened in places that were barely inhabited, we won’t always be that lucky. If the Tunguska event had happened over the city of New York it would have been nearly leveled. Those large enough to cause extinction, 1/2 mile in diameter, occur less frequently – around once per million years. No large scale asteroids or meteors have been found to have an earth crossing path, but the number of people looking compared to the number that may be out there is majorly lopsided. How could we stop an Imminent Impact? Up until 50 years ago, we would have been totally defenseless against one. With the advent of nuclear weapons, we might have the possiblity of lauching ICBM nuclear tipped rockets at it, in an attempt to destroy it. However, doing such could result in creating a worse situation for ourselves. If we broke it into peices, the damage from multiple impacts could be just as bad as one big one. The other option is to do the best we can to prepare for such an impact. Those in the direct path of the impact would stand little chance of survival. however, if shelters areound the world were created to prepare for such an onslaught, with stockpiled food, water and resources – they may be able to hold out until the dust settled. The world they would be coming back out to would be far different than the one they left. With nearly every species and 75-90% of plant life possibly wiped out, humans would literally have to start all over.